I have little time for list books. You know the kind of thing. Fifty things you always wanted to know about chemistry, or whatever. I used to review a lot of children's science books. The kind of 'all you want to know in an easily digestible two page spread (with lots of pictures)' approach is okay in that context, but in something aimed at adults seems downright condescending to me. They must be popular, though, because publishers keep churning them out. But I really don't understand why. 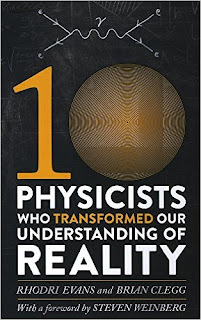 Technically, this too is a list book, but at least it's a more grown-up list with a proper chapter of real sentences on each of the ten physicists featured. There is no doubt, as the introduction suggests, that there is a fascination produced by this particular kind of top ten list, if only because it's pretty easy to disagree with the list used. We discover that both Steven Weinberg in the preface and the authors in the introduction do disagree. 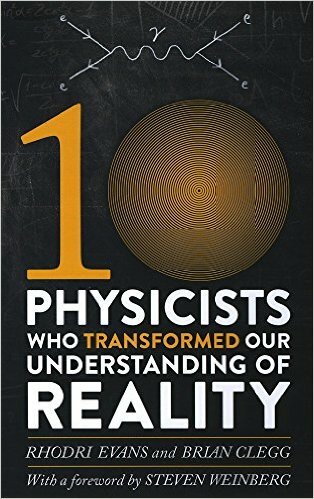 (This gives the rather odd outcome of a book discussing the top ten physicists, using a list that the authors don't think covers the top ten physicists. I can see the point for the fun of the argument, but shouldn't they have corrected the list?). Whatever you think of the ten, we get a pretty good pocket biography of each one, including some insightful comments on the significance of their physics, a process that highlights why Marie Curie should probably be regarded more as a chemist than a physicist. The overall effect, then, is quite interesting, though frankly each of the individuals featured deserves (and has received elsewhere) a solo scientific biography in his or her own right. If you can't be bothered to read ten different books, which many of us can't, this does pull the whole together efficiently and might, perhaps, indicate where you want to read more (for me it was Maxwell's story that really whet the appetite for in-depth discovery). If you think of Ten Physicists as the Reader's Digest condensed book of key physicists, with a little interesting discussion on what makes a great physicist, you won't go to far wrong and you should come out the other end significantly the wiser. Please note, this title is co-authored by the editor of the Popular Science website. Our review is still an honest opinion – and we could hardly omit the book – but do want to make the connection clear.